Zapier allows you to connect BambooHR to 1,300+ apps you use to organize and manage all of their employee data. No coding knowledge is needed and automations can be set up by anyone in just a few minutes. Want to get a summary of who is out of the office every day or week? Looking for a way to add new employees to other systems like QuickBooks? Searching for the best way to get tasks done before a new hire's start date? With app automation tool Zapier, you can automatically get your BambooHR employee data into the apps where it's most valuable to you. That way, you don't have to worry about copying and pasting or exporting and importing employee data by hand. 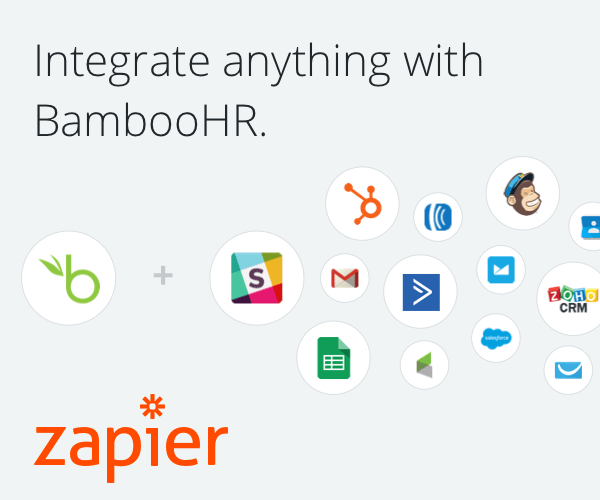 Now that Zapier integrates with BambooHR, you can easily integrate your HR tasks with all of your company's other processes. Automate workflows in other apps whenever a new employee is created, a new time off request is created, new time off is found for selected conditions, or a company report changes in BambooHR. Or you can automatically create or update employees, upload employee files, and respond to time off requests whenever a trigger event happens in other app. You can even get a summary of who's out on a daily, weekly, or monthly basis. 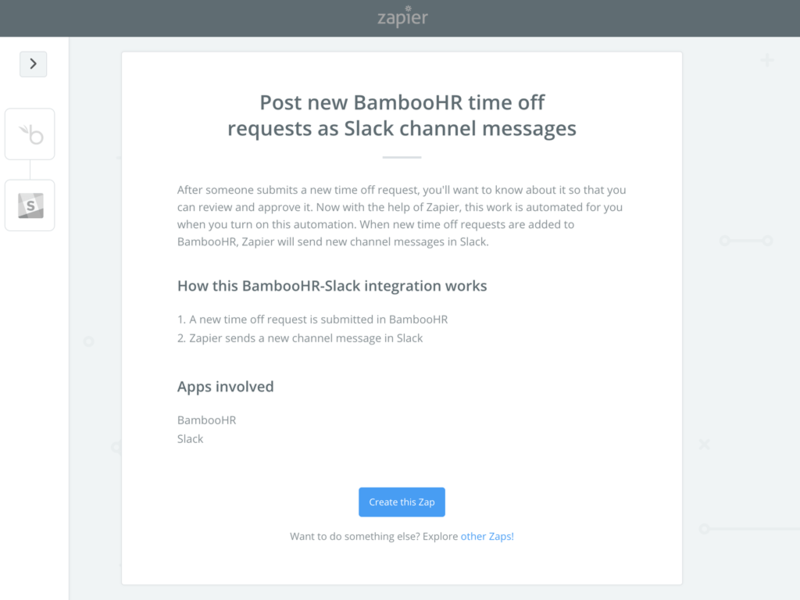 Learn more about the BambooHR integration with Zapier on the Integration Page and turn on popular Zap templates! Automations that are ready for you to turn on! There are over 20 Zap templates (i.e. pre-configured automations of different use cases) that are ready for you to turn on and will make you more productive! 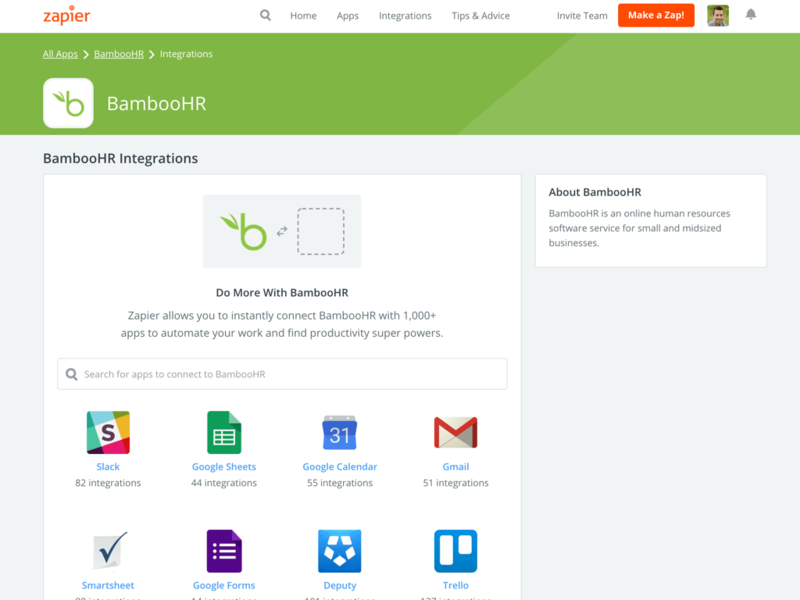 You can also create your own using BambooHR's triggers, actions, and searches. 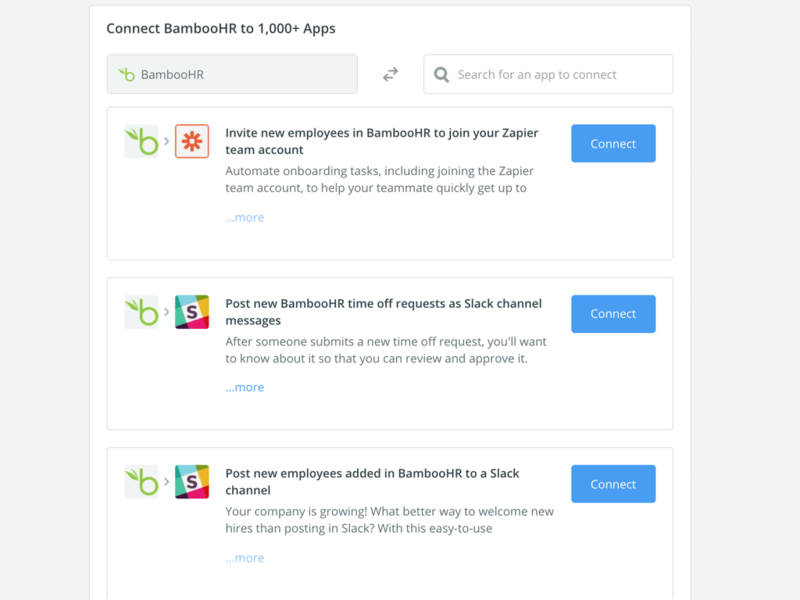 Zapier connects BambooHR to 1,300 web tools. Popular connections include, but are not limited to: Slack, Trello, Basecamp, Asana, Jira, Wrike, Calendly, Expensify, QuickBooks, Xero, and so many more! Easy-to-use Zaps let you automate your activities at work, no coding required! When you start creating a BambooHR Zap, you will be asked to connect your BambooHR account via an API Key. Once this has been completed you will have access to 1,000+ Apps available in the Zapier Integration Platform; therefore, making your day to day activities easier and readily available.